Through the lens of her camera, Dorothea Lange documented American life with riveting, intimate photographs that portrayed some of the most powerful moments of the 20th century. Lange was driven by the belief that seeing the effects of injustice could provoke reform and, just perhaps, change the world. From documenting the plight of Dust Bowl migrants during the Great Depression to illuminating the grim conditions of incarcerated Japanese Americans during World War II, Lange’s photographs demonstrate how empathy and compassion—focused through art—can sway minds and prompt change throughout this nation’s history. See how Lange’s work continues to resonate with millions and inspire new generations of artist-activists, illustrating the power of photography as a form of social activism. 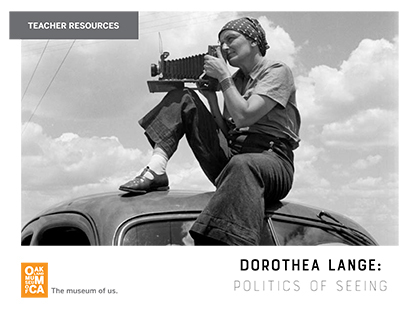 Dorothea Lange: Politics of Seeing presents 130 photographs to celebrate the 50th anniversary of the artist’s gift of her personal archive to the Oakland Museum of California. Drawing upon vintage prints, unedited proof sheets, personal memorabilia, and historic objects, this exhibition takes a unique approach to a beloved American photographer by reuniting photographs with comments and quotes by the people she photographed. Don’t miss a selection of photographs on view by contemporary photographers Janet Delaney, Jason Jaacks, and Ken Light, whose works demonstrate how the issues tackled in Lange’s subject matter are relevant to many of the issues we face today—nationally and globally.